There’s a girl in your political science class that you’re attracted to. You’d like to get to know her better, but the thought of even saying hello makes you sick to your stomach. You’re at the grocery store and you see a colleague from work pushing a cart with his kids. Instead of saying hi and taking part in some small talk, you turn your cart the other direction and do what you can to avoid him. You’re new in town and would like to make some friends. There’s a men’s group at your church that you go to, but you never come early and you leave as soon as it’s over so you can avoid having to engage the guys in conversation. You’re at a party and doing your best to mingle. But every time you open your mouth what comes out seems stilted, and you feel like you’re just making things awkward for others. You leave the party feeling like people must have thought you were some kind of weirdo. You’d like to sit down for an informational interview with a local attorney in town so you can find out more about being a lawyer. You pick up the phone to make a call, but your heart starts beating really fast and your mind goes blank. You hang up and keep putting off that call for the next few months. Do any of those situations sound familiar? If so, then you know what it’s like to feel shy, or at least socially awkward. Shyness is something that all of us battle from time to time, though some experience it in all social situations. While shyness is completely normal, if not properly managed, it can get in the way of us making new friends, meeting potential romantic partners, advancing our careers, or just getting our basic needs met. Studies have shown that women almost universally find shyness unattractive in potential romantic partners. And research from the University of Wisconsin at Madison has demonstrated that shy men lag behind their less shy peers when it comes to being offered good jobs, getting married, and having children. Close relationships are the most important factor in determining a man’s success and happiness over his lifetime, and it’s difficult to form these vital bonds unless you learn how to socialize with ease and confidence. In this 3-part series, we’re going to explore why we sometimes (or always) feel shy and what we can do about it so it doesn’t hold us back from our life’s goals. 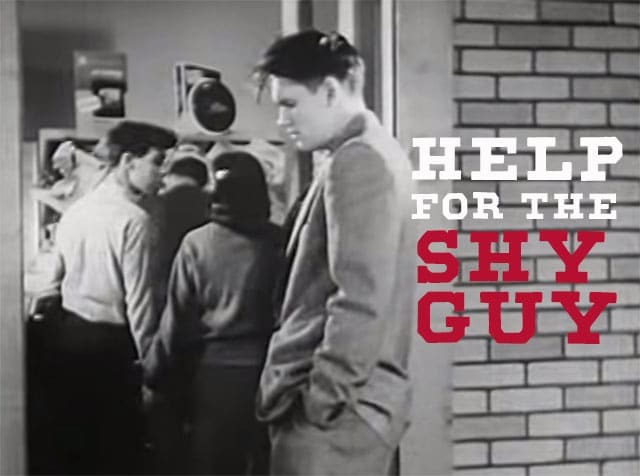 In today’s post, we’ll explore the nature of shyness, including its origins and symptoms. In next week’s post, we’ll explore the faulty assumptions and negative cognitive biases that lead to shyness. Finally, we’ll share tips grounded in cognitive psychology that you can use to overcome your shyness. If you suffer from significant shyness, we hope this series will help you troubleshoot and surmount the problem. Even if you don’t consider yourself a shy guy, but have bouts of mild socially awkward feelings, the insights and advice in this series will still be greatly beneficial. Let’s get started today by uncovering the nature of shyness. Shyness is the discomfort, fear, nervousness, awkwardness, and apprehension that you sometimes experience while interacting with other people. When people feel shy, they experience a whole host of physiological and psychological symptoms. Their pulse races; their hands get clammy; they feel really hot. They may get silent or start talking super fast because of nerves. On top of that, they get sucked into a self-focused, negative thought pattern in which they believe everyone is judging them and noticing how sweaty or nervous they feel. Feelings of shyness are processed in the brain just like any other primal survival threat. While our lives aren’t on the line, something else is: social acceptance. For our ancestors, being shunned and isolated from the protection of their tribe might not have brought about immediate death, but could eventually lead to their demise. Even though social rejection today doesn’t pose such a serious threat to our survival, our brains still react to it in the same way. The desire to avoid this intense psychological anxiety and fear leads us to want to skip out on parties in the same way most of us don’t want to explore a cave full of bears. Shyness expert Bernardo J. Carducci describes this dynamic as “approach/avoidance conflict.” Approach/avoidance conflict occurs when we are faced with a goal that has both positive and negative characteristics, which makes the goal both desirable and undesirable at the same time. For the shy person, simply interacting with others creates this kind of push/pull conflict. They want to reach out and socialize because 1) we’re evolved to be social and 2) there are rewards that come with socializing, like romance, career advancement, or just plain fun. While they have the desire to socialize, shy people simultaneously think about the (often imaginary) risk that comes with interacting with others, like social embarrassment or shame, or simply feeling awkward. In the battle between social rewards and risks, risk usually wins in the mind of the shy man, and he ends up avoiding social situations as much as he can. As we move deeper into what shyness is, let’s be very clear on what it is not: shyness is NOT introversion. Introverts are simply people who prefer low socially stimulating environments over the highly social ones favored by extroverts. While introverts prefer to be alone or in small groups, they don’t feel nervous, anxious, or fearful in the face of social situations. An introvert who is not shy has no problem calling a repairman on the phone or asking a woman on a date. To hit home the point that shyness does not equal introversion, researchers have found that it’s possible to be both extroverted and shy. While these shy extroverts prefer to be around others and are energized by socializing, they simultaneously feel too anxious or nervous to fulfill this desire, thanks to their shyness. The reason introversion gets lumped together with shyness is that shy people often display similar behavior, such as keeping to themselves or avoiding big social events. But again, the two groups are operating from different motivations: the introvert avoids the event because he prefers a lower level of social stimulation, while the shy person does so out of anxiety and fear. The other reason introversion is often conflated with shyness is that if a person does wish to be social, but is fearful and anxious about it, they may not want to admit this and see themselves as hesitant and timid. So, they tell themselves they aren’t actually shy, but are simply introverts (who have the cool, mysterious air of solitary artists and loners) and like keeping to themselves anyway. It is perhaps because the need for a tribe is so universal and deeply-rooted that shyness is extremely common. About half the population describes themselves as shy, and 95% of individuals report experiencing shyness at some point in their lives. Even super successful public figures like Johnny Carson, David Letterman, Barbara Walters, and Al Gore, have surprisingly described themselves as shy. So if you’ve worried that something is wrong with you because you get nervous around others, you don’t need to. You’re not alone, and you’re actually in some good company! Even the most extroverted people-person can experience shyness at times. While they may be the life of the party and feel completely at ease with folks from similar backgrounds as them, if they have the chance to meet some celebrity they admire or want to talk to a person they find attractive, they may find themselves stuttering or drawing blanks as they speak. This is what shyness experts call “situational shyness” and it affects most people from time to time throughout their lives. If you have no problem socializing in most instances, but get super nervous when calling someone on the phone, that’s a form of situational shyness too. Some individuals have a pervasive, generalized anxiety of socializing that prevents them from ever feeling comfortable around others. If the feeling of discomfort is extreme and disrupts a person’s life for an extended period of time, it could be classified as social anxiety or social phobia according to the DSM-5 (the American Psychiatric Association’s classification of mental disorders). The line between social anxiety and plain shyness is pretty squidgy though, as many of their respective symptoms overlap. Consequently, shyness has been described as a mild and intermittent form of social anxiety. Because the symptoms and mechanisms for shyness and social anxiety are so similar, for the purpose of this series, we’ll use the terms interchangeably (cue psychology majors getting agitated!). While the symptoms of shyness may be rooted in our primeval past, what causes one individual to be shyer than another? Shyness or social anxiety is caused by a whole host of biological, environmental, and cognitive factors. Researchers are pretty sure that no one is born shy; there isn’t a “shy gene” so to speak. With that said, biology can make a person predisposed to becoming shy or socially anxious later in life unless one’s childhood circumstances and upbringing push them in a less timid direction. Up to perhaps half of our personality is genetically inherited, and some temperaments are more prone to shyness than others. For example, babies who react more anxiously to new stimuli often grow up to be shy adults. Neurological differences play a role as well: those with brains that metabolize serotonin too quickly sometimes struggle with shyness, as this neurotransmitter is responsible for making you feel calm, relaxed, and sociable. Environmental factors like your relationship with your parents, your childhood experience of being praised or criticized, how you learned to cope with setbacks, whether you were bullied as a child, and the extent of your opportunities for social experiences can contribute to your shyness too. That last factor – lack of opportunities for socializing – may be why the number of individuals who self-identify as shy has been increasing over the past thirty years. With more and more of our communication being mediated through technology and screens, we no longer get the crucial face-to-face social practice that our parents or grandparents had. We can bank, get help with our homework, and even shop for food and clothes without ever talking to a person in real life. Social interaction is a perishable skill. Without constant practice our adeptness at it gets rusty, and we become like social Tinmen who haven’t been oiled in a long time. Then, when we do have to interact with someone in “meatspace,” there’s a tendency to become self-conscious about our creaky social skills, and we feel like we’re awkwardly floundering. The biggest factor of all that causes shyness — whether it’s from time to time or chronically — is the way we think, specifically the faulty beliefs, errant assumptions, and negative cognitive biases we use to frame our social interactions. Shy and socially anxious people think they will say or do something that will cause embarrassment when interacting with others. This fear of embarrassment triggers the telltale symptoms of shyness like feeling hot, having butterflies in the stomach, or saying things in a halting, stilted way. This in turn triggers an extreme form of self-consciousness and self-awareness in the shy person. They turn inward and focus on their symptoms of nervousness and think that everyone else in the conversation is aware of them too, when, in fact, most people don’t notice. This acute self-consciousness is what continues to fuel shy and socially awkward feelings once they start. We can’t do much to alter our biology or change our past, but we do have control over how we think. Because you can change the way you think about socializing and about shyness, and because it’s the most important factor contributing to why you experience shyness, it’s important to understand in detail what exactly goes on in your head before, during, and after a social encounter that causes you to feel shy. By understanding and being aware of the mechanics of “shy cognition,” you’ll be better equipped to take steps to overcome your awkwardness and socialize with ease and confidence.